Published March 18, 2018 at 4752 × 3168 in Roye New British Cemetery. 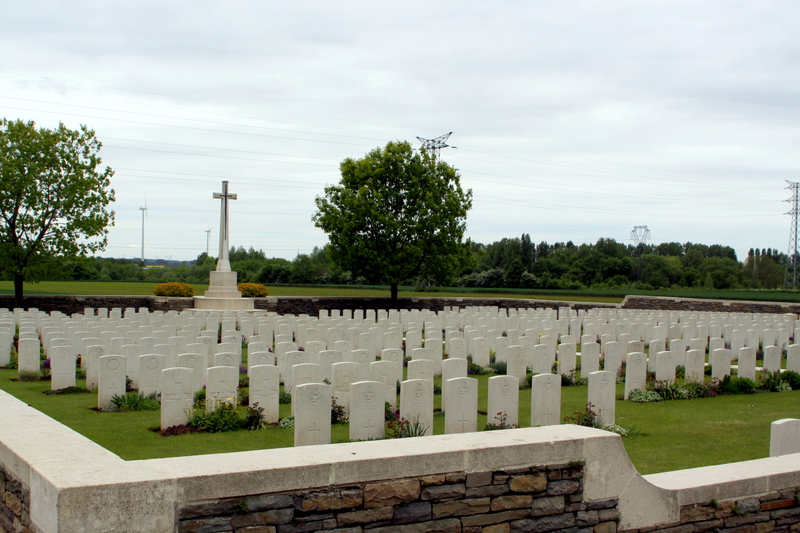 Also buried in this cemetery are two officers of 9th Royal Irish Fusiliers: Major John George Brew, who was shot after being captured and died of wounds in captivity on 6 April 1918, and Second Lieutenant William Henry Roche, who was killed in action on 27 March 1918 at Erches. Also buried here are two soldiers of 1st Royal Irish Fusiliers: 8746 Private Joseph Adamson, captured on 21 March 1918 and died in captivity in a military hospital at Ham on 6 June 1918 from an abdominal gunshot wound; and 41810 Private Alexander Patrick, killed in action on 24 March 1918. A third soldier of 1st Royal Irish Fusiliers, 18114 Private Walter Behan, who was wounded in the head, captured and died of wounds in a German military hospital in Goyencourt on 2 April 1918 is commemorated on a special memorial here; he was buried in Goyencourt Chateau German Cemetery but his grave was lost. A former soldier of the 7th/8th Royal Irish Fusiliers, Private James Maylin was killed in action on 22 March 1918 serving with 277th Company, Labour Corps, and buried in Marchelepot British Cemetery, which was later destroyed; he is commemorated on a special memorial.